These phrases—Mercy, Witness, and Life Together—illustrate how the Church lives and works together to proclaim the Gospel, pour out the mercy we have received, and live in the fellowship that Christ our Lord creates, preserves, and sends into the world (Acts 2:38-42). In all the ways that humanity keeps trying to stretch up to the heavens to have and maintain a relationship with God, we reveal the God Who has reached down to humanity through His sinless Son’s cross and resurrection and continues to be in the midst of His People through the objective means of His Word and Sacraments. (Romans 6:4, John 20:23, 1 Corinthians 10:16). This special emphasis for our common work together in the Lutheran Church – Missouri Synod is available for further study at https://www.lcms.org/emphasis. Mercy: We cannot help but be merciful to others because Christ, our life, has been merciful to us (Luke 6:36). Mercy is the heart of God. Christ redeemed us without any merit or worthiness in us. Jesus came into the world for sinners lost in the condition of sin and eternal separation. We were redeemed by His innocent suffering and death through His atoning blood on the cross without any merit or worthiness in us. We live in, through, and by the mercy we have received from our Lord. Each of our mission starts choose one means of mercy work that clearly reveals the loving heart of the Triune God for fallen humanity in the Gospel. This chosen course of action is the principle way of engaging the community and meets a critical need of people being neglected in that area. The KEY ACTION for Mercy is Gospel motivated service which meets a crucial community need which brings people into contact with the location where they can hear the Word of God and have the opportunity to be introduced to the Christian life. Witness: As Christians, we cannot help but speak about what we believe and know to be true about God’s everlasting Word and life-giving Gospel (Acts 4:20). The Biblical witness is not persuading people to try and understand some information about God, but rather an eyewitness testimony of what we know to be true in the revealed and finished salvation of Christ Jesus, Who was crucified for sinners (John 1:29). We have little interest in telling ‘our story’ because our story doesn’t save. Only God’s story does. In all our conversation, the goal is to get to the point where we tell people what Jesus has done FOR THEM. This requires love, honesty, persitance, and patience as we speak both Law and Gospel as necessary (2 Corinthians 6:7). We do not quit on people just because they do not agree with accurate, Bibical teaching right away. It may take many years, and even decades of collegiality, conversation, and friendship! This should not cause us to lose heart, for we know that the Word of God is living and active, sharper than any two edged sword (Hebrews 4:12)! There is nothing lacking in the power of the Word. We are the ones who are hard-hearted and slow to believe all that the Scriptures have spoken (Luke 24:25)! In concert with our life of witness, each new mission start has a means of discipleship that challenges those learning Christ to understand the six chief parts of the Christian faith (10 Commandments, Apostle’s Creed, Lord’s Prayer, Holy Baptism, Confession and Absolution, and the Sacrament of the Altar) so that catechumens will be faithfully and consistently prepared for Baptism, Confirmation, and to receive the Lord’s Supper. In some cases, a year long catechumenate is offered so that each person can stand up in the rock solid confidence we have in Christ. As the Baptized then meet the challenges of the Christian life which will most certainly be ahead, they will face them with a sound standing on the Scriptures. This continues to be crucial for all of us as we continue to engage a population that is almost Biblically illiterate. The KEY ACTION for Witness is the development and ongoing implementation of a catechumenate where people of every culture can be immersed in God’s Word and learn Christ (1 Corinthians 15:1-3). Life: A mission start should begin with a trust in the Word of God alone as the power to create faith in the lives of those who don’t believe. Material resourcing will come as a result of the power of God’s Word and not the other way around. As quickly as possible, the new start should begin witnessing in its fullest capacity as believers begin to gather around the Word and Sacrament. When we gather for the Divine Service in orbit around Jesus, it is the highest form of witness. There is the Word preached which points people to “Christ Jesus and Him crucified (1 Corinthians 2:2).” There is the Sacrament of the Altar where “As often as you eat this bread and drink the cup, you proclaim the Lord’s death until He comes (in 1 Corinthians 11:26).” Our lives and vocations full of eye witness testimony to our Lord’s saving death and resurrection flow from His saving Word and Gifts. God Himself establishes life together with Him through His Divine and saving activity. Christians do not purposely live in isolation from each other, but as the very Body of Christ gathered around the Body of Christ in the Lord’s Supper. The KEY ACTION for Life is a place where the Word of God is taught in its truth and purity and the Sacrament is rightly administered so that believers are empowered for vocational existence (Colossians 1:27). 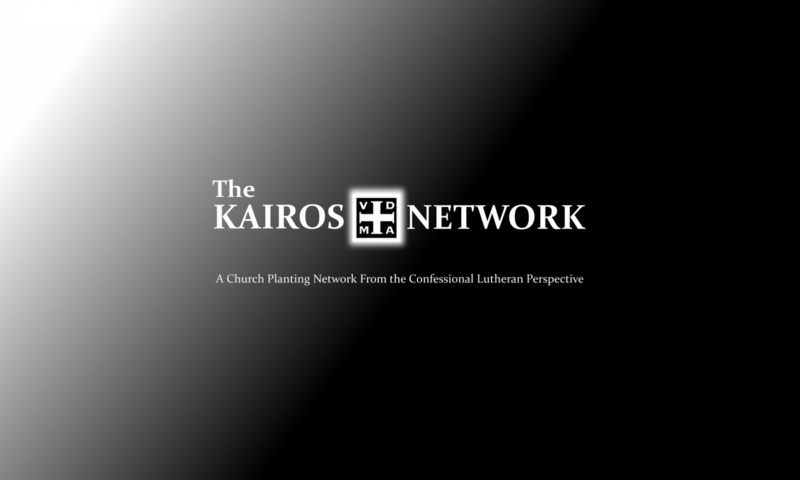 Each of these three parts of the Kairos Network Action plan should be stacked upon and next to each other. In other words, Mercy should not be separated from Witness. Witness should not be separated from Life Together. Life together should not be separated from Mercy. It is crucial that the intent of the mercy work is to bring people to where they can learn Christ, and to bring those learning Christ to Font and Altar, and those brought to Font and Altar sent out as His Body into the world. We do mercy, life together, and witness gathered around the place where Christ has promised to be in His chosen means of grace.